Canada’s share of global oil consumption may seem low in comparison to the US, China and other countries, but Canada has just 0.5% of world’s 7 billion inhabitants. That said, our more than 35 million people are spread across a vast land, making long-distance transportation of people and goods a daily necessity. Further, most of us need both winter heating and summer cooling! In the March 2015 issue of PatchWorks, we looked at worldwide oil supply. This issue focuses on the flip side of supply – demand. Let’s begin with a peek at oil demand by region. According to the most recent statistics, the world’s biggest consumer of oil (including natural gas liquids) is the United States, with 19.9% of the world’s consumption, followed by China with 12.1%. Canada’s consumption of 1.5 million barrels of oil per day makes up 2.5% of the world’s consumption. The graph below shows the world’s top 10 oil consumers. Worldwide oil consumption is on the rise – and Canada is poised to take advantage of the coming growth in demand. Now let’s look at the most recent data on global oil demand. 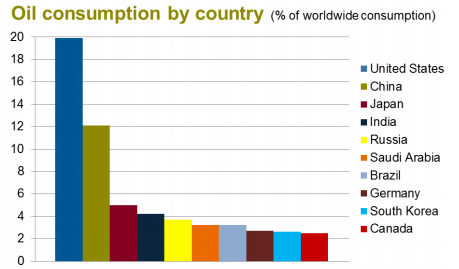 Worldwide, oil consumption grew 1.4% from 2012 to 2013. Global demand then bottomed out in mid-2014, according to a recent report issued by the International Energy Agency (IEA), but has been growing steadily ever since. By the end of 2015, the IEA expects worldwide demand of oil to reach 93.5 million barrels per day (mb/d), compared to 91.3 mb/d at the end of 2013. On the world market, we are currently oversupplied with oil, but with demand growing steadily as predicted, it won’t be long before global demand for oil equals – and even surpasses – supply rates. Canada, with its vast reserves, skilled personnel and international reputation for safety and innovation, is poised to take full advantage of the forecasted growth in demand for oil.